These little guys – officially known as arancini – are tricky, but worth all the effort. Prepare to make a few extras, so you can snack while you’re frying, because they’ll be gone as soon as they hit the table. 1. Combine eggs, risotto and 1/2 cup of the bread crumbs in a large bowl. 2. Place the remaining breadcrumbs in a medium bowl. Form risotto mixture into 1.5″ diameter balls, then roll the balls in breadcrumbs to coat. 3. In a large pan, pour canola oil to depth of 1 inch. Heat the oil over medium heat to 350 degrees F. The oil is ready when a drop of batter sizzles and rises to surface. 4. 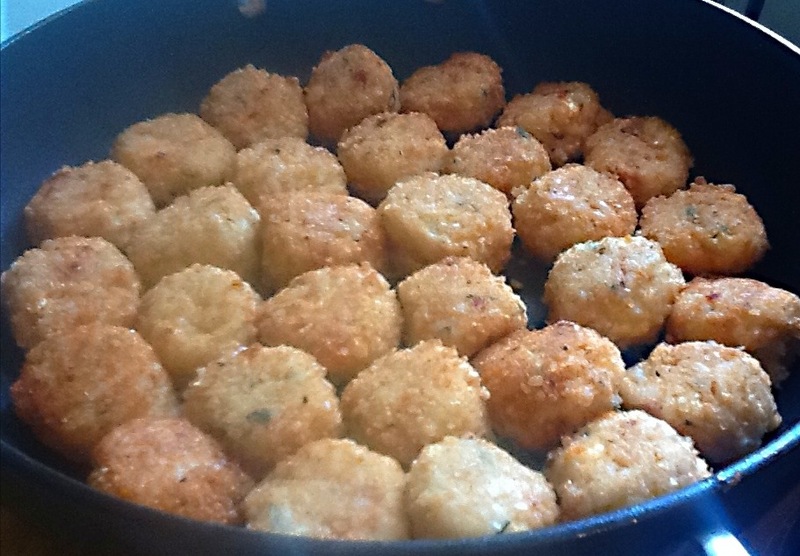 In batches of 4 or 5, add risotto balls to oil and cook until golden on each side. 5. With a slotted spoon, remove risotto balls from pan and drain on paper towels to drain. Season with salt then serve hot. 1. Over medium flame, heat olive oil in a heavy, large saucepan. Add butter and melt. 2. Add the onions and saute until tender, about 8 minutes. Add garlic and cook til softened. 3. While snd arlic are cooking, bring the broth to a simmer. Keep warm over low heat. 4. Add rice to the onions, then let toast for a few minutes. Ladle in 1 cup of hot broth and cook over medium-low heat until the liquid is absorbed, stirring often, about 3 minutes. 5. Continue this process until the rice is creamy – about 20 minutes. 6. Mix in the Parmesan, mozzarella, milk, lemon zest and herbs. Season to taste with salt and pepper.